Traveling during the holiday seasons is never cheap. Booking early helps, but there is no rule of thumb to follow when making cost-effective travel plans. Just a few days ahead and the great Christmas and New Year breaks will come knocking in our doors. Halloween and Thanksgiving Day has just passed, but let’s find out a few tips and tricks to learn in this post. Booking too early can be just as costly as booking too late. October is the best month to book for Thanksgiving or Christmas travel. Make sure to avoid purchasing airfare near Halloween. You will see a small spike in prices for this holiday. Prices begin to slowly climb in November. The final two weeks leading up to Thanksgiving starting getting really pricey. For Christmas travel, make sure to purchase your tickets at least ten days out from Christmas Day. There are many theories floating around concerning which day of the week and time of the day are best for buying tickets. There is no real discernable gain from focusing on a particular day to purchase flights. Prices depend more on your routes, dates, and demand. Pricing is too nuanced to pin down a day and time for more affordable fares. It matters more which day you fly on than which day you purchase your tickets. If you have flexibility in your schedule, extending your trip will usually save you money. As one of the busiest travel days of the year, departing the Wednesday before Thanksgiving is the most expensive. Flying out on Monday or Thursday instead can save you up to 50 dollars on the first leg of the trip. The busiest return day is Sunday. Returning on the Wednesday following Thanksgiving can save you a whopping 160 dollars. Take the time to research what days are the best to travel around each holiday. Avoiding busy travel days can save you time and stress. Not surprisingly, some destination cities are more expensive than others. Flights to Miami, Fort Lauderdale, and Orlando see the biggest price spikes during the holiday seasons. New York City to Florida is the most popular winter holiday route. Denver to Boston sees equal spikes around Thanksgiving. There are many tools and hacks that can help you navigate holiday travel prices without losing your mind. Sometimes the Cheapest Flights are found on secondary booking sites like Nanak Flights. They receive direct deals from airlines that they are able to pass on to customers. Just because you have purchased your plane tickets doesn’t necessarily mean the stress is over. Traveling during the holiday season means more crowds. Try to be courteous to airline workers. You will reap the benefits of a kind smile and patients. Airline staff is having to work with their fair share of disgruntled passengers, be kind. Here are some other tips to help keep you sane during the holidays. Less is more. This is especially true when it comes to packing. Bring the right clothes. Look at your itinerary and note an outfit for every occasion. Use the same or similar outfits where possible. A practical wardrobe with seven core pieces that can mix and match will do for most trips. Pick two pairs of shoes, one that packs easily, and a couple of accessories (scarves and jewelry). Remember, you can always do laundry on the go. Traveling with less means you can keep your luggage close to you, which reduces the likelihood it will get lost. A smaller bag also means less hassle getting it in the overhead bin. Prepare in advance. If you are traveling to another country, take the extra time to make sure all of your documents are in order. Consider pre-ordering cash prior to travel. This can save you the frustration of extra charges on your credit or debit cards. Make sure your passport is in order. Check the expiration date and all your visas. Some countries even require a certain number of blank pages in your passport. 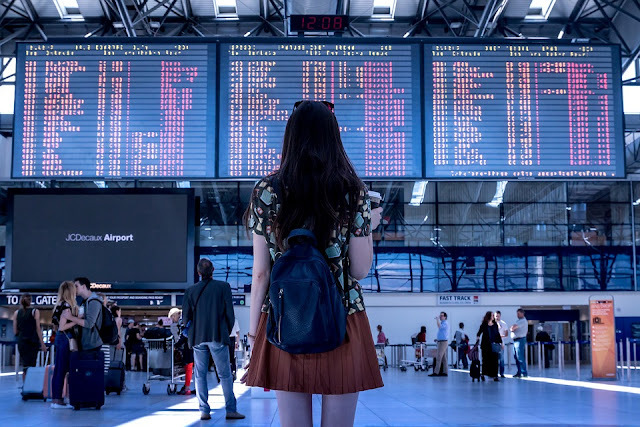 If you are traveling within the country, check your flight times and make sure everyone has their tickets ready and any identification necessary. Bring entertainment. Bring along a book or crossword puzzle. Depending on your phone may leave you pulling out your hair. Busy travel times means everyone is going to be fighting over charging stations. Save your battery and resort to traditional reading material or travel games that don’t require your device. Travel during the holidays can be stressful. Plan ahead so you can enjoy your time with family and friends. Book your flights in advance. Travel light and bring some fun, travel-friendly entertainment.